Belo Baby Launches All-Natural Skin Care Products for Babies! We moms always have a thing when it comes to products we use for our baby’s delicate skin, isn’t it? As for myself, I always go for safe, natural and gentle when deciding what skin care to use for baby Trey. In my mind, I have this shortlist of what to buy (and what not to buy) for my little one when I hit the stores. I am so sure you’re just like me who can be so meticulous with anything that touches your precious baby! 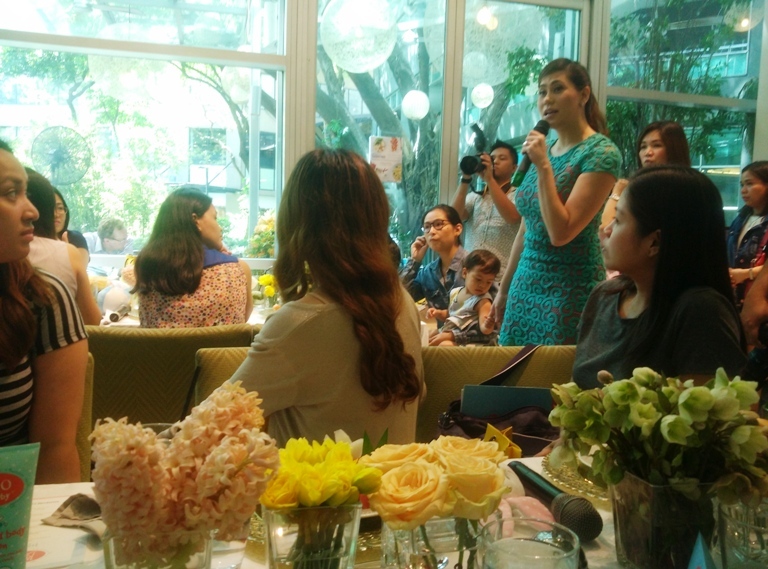 Well, just last week, I feel wonderfully blessed to be seated with an intimate group of blogging mommas and some celebrities for a sweet lunch in Museum Cafe at Greenbelt 4. We talked about a lot of things, but we did dig a bit deeper about skin care for babies. And over that sweet lunch, Belo Baby, a new line of baby care products was introduced to us. You’ve read it right, the brand that is synonymous to beauty now has its own line of baby products! I guess you’ll be happy you’ll be happy to know this: The newly launched Belo Baby products are 100 % natural and they have zero harmful chemicals in them! It was the beautiful Cristalle Belo who charmingly introduced the brand to us. The Baby Belo mombasadors Patty Laurel-Filart, Kelly Misa – Fernandez and Nicole Hernandez – delos Angeles were also there to share their hands-on experience with the brand. I was delighted to have heard from them that Belo Baby is safe, natural and gentle, especially formulated for baby’s delicate skin! Cocoa Butter. A natural ingredient which has antioxidant and anti-inflammatory properties, tested to strengthen and moisturize skin. Shea Butter. A natural ingredient also known superfood for the skin. This kind of butter can naturally heal common skin conditions of babies (like eczema and rash). Made with 100% Certified Natural Ingredients and 0% Harsh Chemicals, crafted with care for baby’s delicate skin! To keep baby’s delicate skin needs in its purest form, not only did the Baby Belo team consider the what ingredients to put in, but what to put out as well. They made sure that Belo Baby products are truly free of harmful substances such as sulfates, parabens and phthalates (Google up how harsh these chemicals to the skin are!). Then again, after all the Belo Baby goodness shared to us at the launch, in my mind I was already thinking that their products could be expensive as they only used premium, all-natural ingredients. But, I was pleasantly surprised to know that they’re affordable and reasonably priced! To give you a little idea on the price range, the Belo Baby Hair and Body Wash (which my son is currently using) is priced at PHP 219.75 and the Baby Bar Soap is at PHP 79. 75. Should you also like to try Belo Baby Face and Body Lotion, it’s at PHP 224.75! One more thing, Belo Baby also has a cologne line. They currently have three scents which all smell so good! In case you want to try Belo Baby products and now wondering where to purchase them, they’re available in all leading supermarkets and drugstores nationwide. You may also opt to purchase in the convenience of your homes as they’ve partnered with Cudsly, Zalora and Lazada!